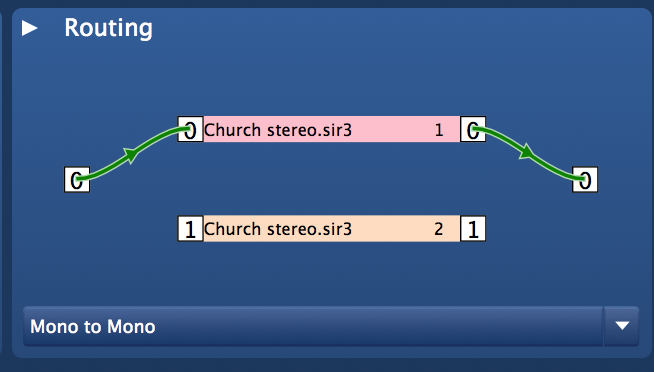 SIR3 is a reverb device that works with impulse responses. It is based on the mathematical convolution operation. 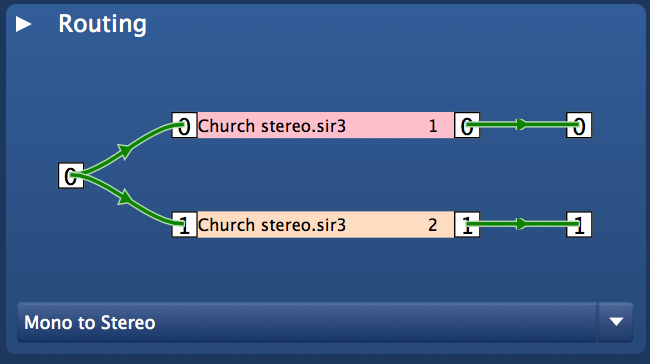 In addition, SIR3 allows you to shape the audio-signal in multiple ways. It has a very flexible modulation section which allows you to transform certain parts (head or tail section) or the full impulse response in the time domain. It also offers a rich set of dynamic processing opportunities like gating and ducking. An impulse response (IR) is an acoustic fingerprint of physical or virtual space. There are several ways to produce impulse responses. Send a short broadband signal into a room and record the corresponding room-reflections. Send a broadband sine sweep into a room and record the corresponding room-reflections. 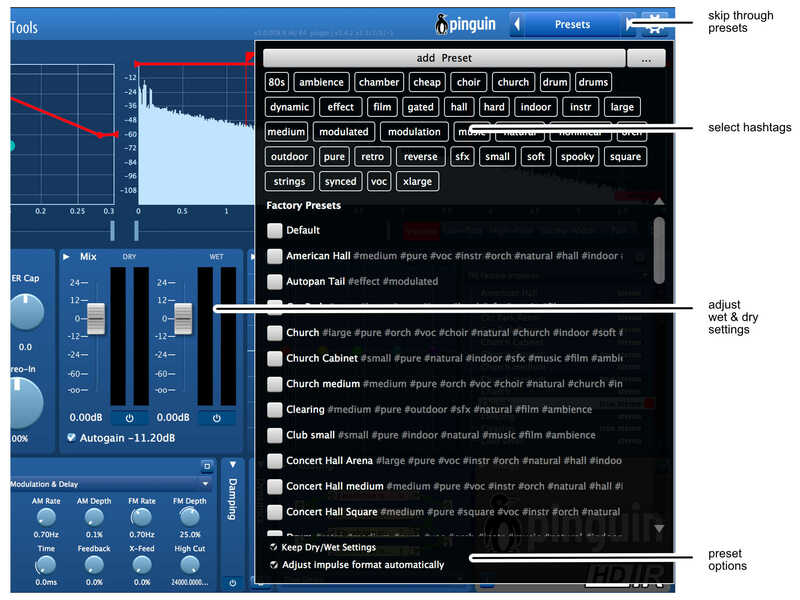 Use a special deconvolve software ( for example Pinguin HDIR-Creator ) to create the impulse response. Send a 1 sample big rectangle signal through a digital reverberation unit. Record the output. Open the DMG and double-click on the containing PKG File. Press "continue" on the welcome screen, then click "Install" and enter your admin password. The actual setup software will start afterwards. If you want, you can enter your license-key now. The right plugin-paths for VST, VST3 and AAX plugin formats are pre-configured automatically. If you want, you can change them manually, but that is not recommended. Press "Install Now!" and confirm the installation settings. If you want, you can enter your license-key now. Choose the right plugin-paths for VST, VST3 and AAX plugin formats. If you are not sure where the plugin directory of your DAW software is located, please look into the manual, or use the settings dialog of your DAW. Please be sure that the host is using the same architecture (32bit/64bit) as the plugin. When you open the full version of SIR3 for the first time, a license-key dialog appears on your screen. Please enter the license key you received and restart your host application. Just open the setup-application and select "Uninstall"
With this control, you can adjust the delay between the dry signal and the start of the impulse response. The higher the value, the closer the signal will appear to the listener, because the time between the direct (dry) signal and first reflections will be longer, as it would be in a natural recording. Because if the microphone is closer to the signal source, the direct (dry) signal will reach the microphone sooner than the reflections. Usually, this is often used with a vocal signal and other signals that should stay in the front of the mix. Also, this is a good method to ensure that the mixed dry/wet does not sound blurry. Use a double click to reset this parameter. Decay is the amplification over time. 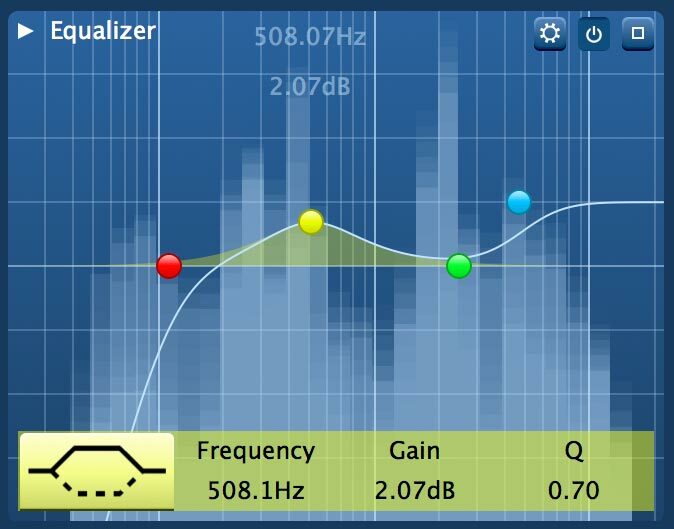 With this parameter, you can control how the reverberation continues over time. A value -3dB/s means that the impulse gain will be reduced by 3dB per second, which leads you to perceive the room as smaller. This control adjusts the up & down-sampling of the impulse response (like a tape-recorder which is playing slower/faster). You can adjust this parameter in semi-tones. High values will result in a brighter and shorter room, lower values will result in a darker and longer room. Use a double click to reset this parameter. "ER Cap" changes which early reflections are audible and which are muted. Also, you will immediately see optical feedback in the "Early Reflection Diagram". Early Reflections are the first reflections which reach the listener's ear and are really important for the perception of the room. Negative values mean that all reflections above threshold will be deactivated, positive values will remove reflections below the threshold. Lowering the early reflections leads to a more transparent room impression, while lifting the room lets it appear more vivid. The detection of early reflections is limited to a dynamic range of 40dB and a timespan of the first 300ms of the impulse response. This option is only available with HDIRs (Pinguin's High Definition Impulse Response). "On" means that you can use the "Dry-Information" of an impulse response for a very realistic reverberation. NOTE: If you are using this, please mute the dry-signal ( 4.2 Wet & Dry ) to avoid flanging. If you use the plugin as a send effect, this option should generally be disabled. In order to create interesting effects, you can reverse the impulse response by clicking on this button. This control adjusts the stereo-width of the incoming signal. That is important to control how much the middle (mono) or side-signal (stereo) has an influence on the effect signal. Use a double click to reset this parameter. With these faders, you can change the dry and wet (reverb signal) level. You can mute the wet/dry signal by clicking the on/off button below the fader. "Autogain" is an automatic volume compensation, you can turn it on/off by clicking on the button. This feature is useful when you are browsing through different Impulse Responses, to avoid adjusting the wet level every time you select a new item. Use a double click to reset dry and wet level to 0dB. SIR3 has an integrated minimal phase equalizer which filters the wet-signal only. Drag the small round knobs to change values of the filters directly on the display, or use the floating panel to enter values via the keyboard. With a right mouse-click you can open a context menu to reset the equalizer, or choose the analyzer mode. If a knob isn't accessible because it appears behind the floating menu, move the mouse away from the equalizer, the floating panel will automatically disappear. The spectrum analyzer, which can be configured either as an analog IIR like analyzer or as an FFT-style analyzer, displays the frequency spectrum of the wet signal. You can switch between both modes via right mouse-click. The file browser is an interactive file-tree which can be used to browse the files-system. Only files which are loadable into the SIR3 will be displayed. The file browser has a few pre-configured file-locations, which are used the restore the references impulse-files across different platforms. The factory-library contains impulse-models that are delivered with SIR3. The default location, chosen by the installer, should be accessible for any user on the computer. All factory-presets in SIR3 are using this library. The folder that every user has access to in order to store their own IR-files. This is important if you move from one machine to another. As long as the relative file-path in the folder doesn't change, SIR3 should have no problems accessing the files, wherever the location of the user-library file path is. So if you are using custom IRs, it's recommended to copy them into the "User"-Folder. Another important fact is that – provided you have upgraded from SIR2 to SIR3 – this folder will automatically be configured to use the same file location as the main-impulse folder of SIR2 (because unlike SIR3, SIR2 only used a user-specific file-path for impulses). If "Auto Load" is activated, the selected impulse file will be automatically loaded into SIR3. If not, you can load them by dragging them into the routing-box down below. That way you can use multiple files to compose a patch. 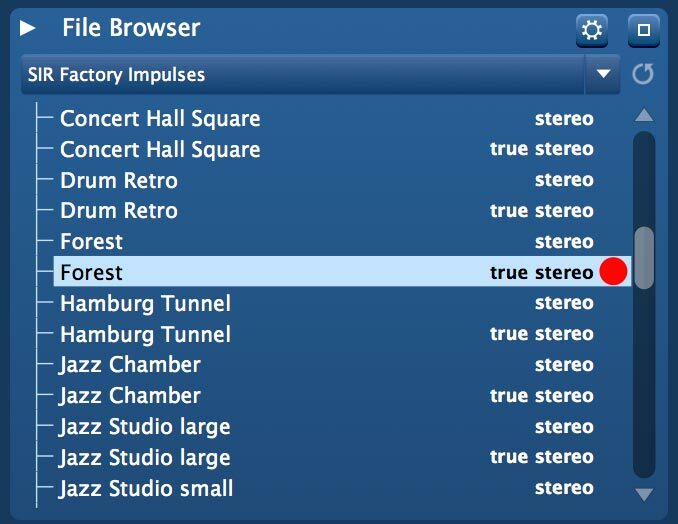 "True Stereo"-Impulse sets are often provided in a certain format (2 stereo files = 4 channels), where one stereo-file has an "L" and the other file has an "R" at the end of the filename. 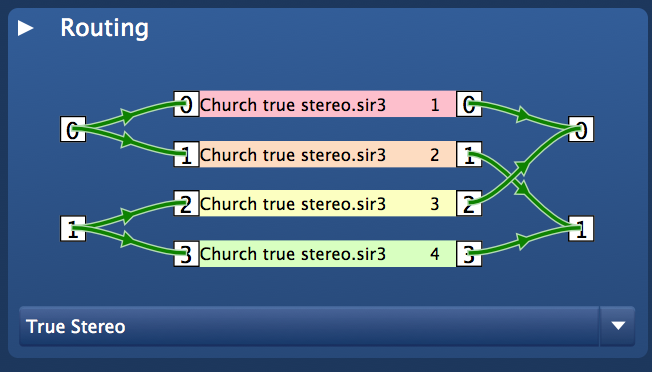 If "True Stereo Selection" is on, such file-sets will be automatically loaded together into SIR3, and the routing will be automatically configured correctly, as "true stereo". SIR3 includes a rich modulation section which can be used to modulate the reverberated signal in a lot of ways. Use this setting to choose the target of your modulation. 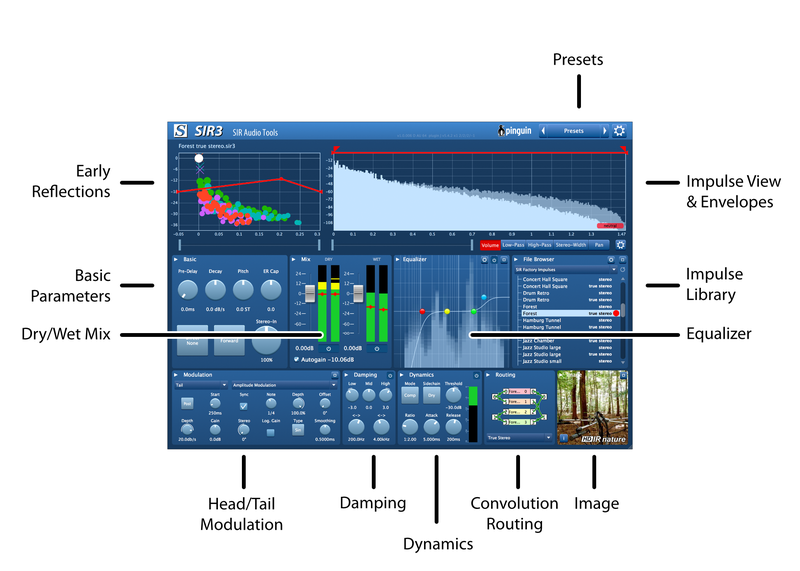 With SIR3, you can either modulate the head, the tail or the whole impulse response. Modulate the early part of the impulse response. Modulate the last part of the impulse response. Modulate the full impulse response. Choose "Pre" if you want the modulation to happen before the convolution stage. Choose "Post" if you want the modulation to take place after the convolution. 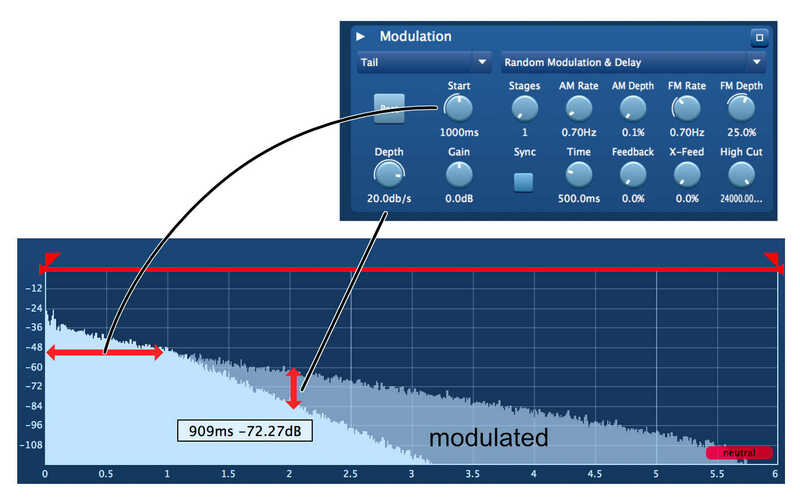 If the modulation target is "Tail", this is the position that indicates after which amount of time the modulation begins. This setting controls how fast the amount of modulation increases after the start position is reached. Use this setting to change the output gain of the modulated section. The amplitude modulation can basically be described as a tremolo effect. Turn this on, to synchronize the oscillation to the length of a musical note. Depending on the "Sync" setting, this is either a frequency or the length of a musical note. This is a factor of how intense you want the amplitude modulation to be. If you choose zero degrees, the modulation of the left and the right channel will be synchronized. With 180 degrees, the phases of the modulation will be inverted between the left and the right channel, which will create an "autopan"-like effect. This setting indicates whether the gain modulation happens in a linear or a logarithmic way. Sets the modulation waveform, which can either be sine, saw-up, saw-down or square. This setting smooths the envelope form. If you choose "sine" as a waveform, this setting will have no effect. 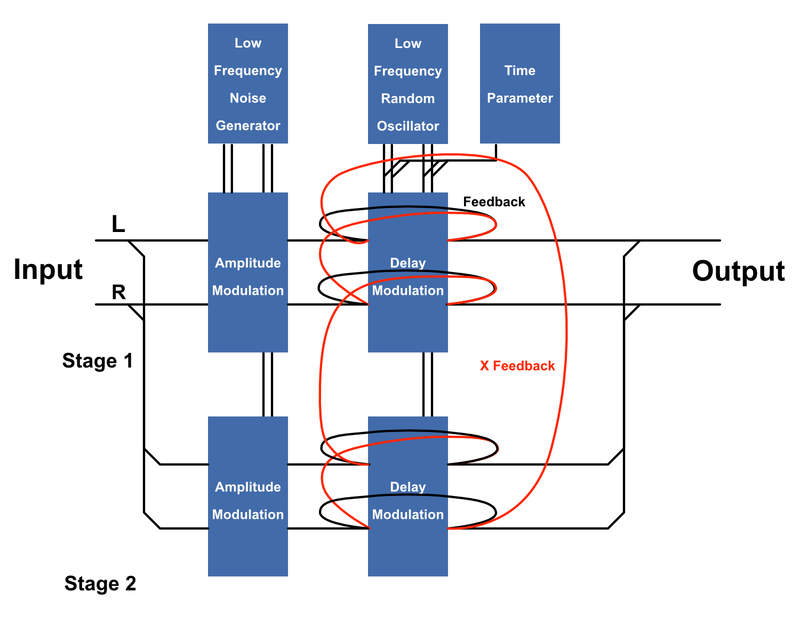 A multi-stage delay with random pitch modulation and random amplitude modulation in the feedback path. The number of parallel delay-loops. The speed of the random tremolo in the delay feedback path. The impact of the random tremolo in the delay feedback path. The speed of the random pitch modulation in the delay feedback path. The impact of the random pitch in the delay feedback path. Controls if the delay time is defined in seconds or matches the length of a musical note. Sets up the delay time. If you choose zero, it will sound like a chorus. The feedback of the delay. The feedback which goes from the left to the right channel, or the right to the left channel. If you use two stages, the feedback path goes from 1. stage left → 1. stage right → 2. stage left → 2. stage right → back to 1. stage left. If you use three stages, the feedback path goes from 1. stage left → 1. stage right → 2. stage left → 2. stage right → 3. stage left → 3. stage right → back to 1. stage left. The feedback path also contains a high-cut filter, which can be used to darken the sound. Use this parameter to control the cutoff frequency. The amount of damping (or amplification) over time on a specific frequency range. Example: If you want to have a longer decay in the mid-frequency range, drag the middle dial to a higher value. Use the two dials at the bottom to set the cutoff frequencies which divide the three different frequency ranges: Low, Mid and High. The dynamics section dynamically controls the loudness of your wet (reverb) signal path. One special feature is that you can use the dry signal to control the loudness of the wet signal. So you can do things like gated reverberation, or ducking the wet signal with the dry signal, so that the reverb signal will be lowered when the dry signal is louder. Technical Note: Both compressor and gate use an RMS level (root mean square, with exponential decreasing window) in the sidechain detection. In the dynamics section, you are able to use either the compressor or the gate module. Change the function via the "Mode" switch button. Both modules have separate changeable parameters. In gate-mode, the "wet"-signal will be reduced when the sidechain signal falls below the threshold level. In compressor-mode, the "wet"-signal will be reduced when the sidechain is above the threshold level, the impact is controlled with the ratio parameter. With "wet", the wet signal will be controlled by itself (like a normal compressor/gate). With "dry", the detected dry signal loudness will control the loudness of the wet signal. In "gate" mode, whenever the dry-signal is above the threshold level, the "gate" opens and you hear the reverb signal. This can be used for the so called "gated reverb"-effect on drums or any other instruments. If you select the "compressor" mode, you can reduce the amount of reverb with the dry loudness. For example, the reverb signal will be reduced while you hear the voice, but will be louder in the pauses. In "gate" mode, this value controls how loud the signal needs to be, to open the gate. In "compressor" mode, this value controls the point above which the level will be reduced. The amount of reduction of the wet signal, when the sidechain signal falls below the threshold level. The ratio how much the wet signal is reduced, when the sidechain signal overshoots the threshold level. This control changes how fast the dynamics section reacts when the sidechain is above the calculated target volume. The minimum time, that the gate should be opened. With this control, you change how the fast the dynamics section returns to the original level when the sidechain is below the target volume. Shows the amount of reduction which is applied to the wet signal. With the channel routing display, you can set which channel of the input signal will be processed with which channel of your impulse response file. 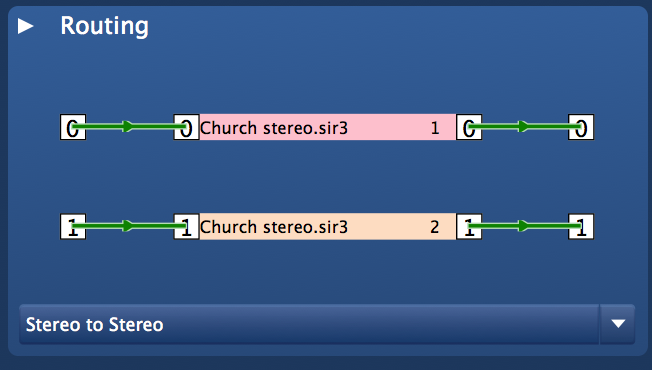 By clicking on the channel routing display you can toggle between "Stereo to Stereo", "True Stereo" and other possible modes. True Stereo is only possible with a 4 channel impulse response File. Left input channel will be convoluted with IR-channel 1, the result will be added to the left output. Left input channel will be convoluted with IR-channel 1, the result will be added to the left output. Right input channel will be convoluted with IR-channel 1, the result will be added to the right output. Best for mono (100% stereo compatible) reverbs. One input channel will be convoluted with IR-channel 1 and IR-Channel 2, the result will be added to the left and right output. This channel-routing is useful for hosts that support "mono to stereo" configurations. "True Stereo" in SIR means that a stereo convolution takes place for every source channel separately. This will result in a more realistic spatiality. 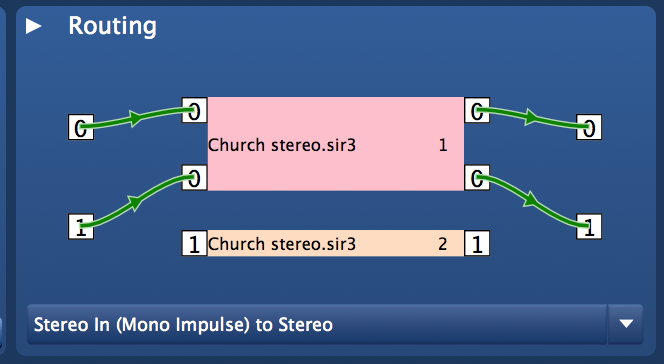 True stereo makes sense for source signals containing different sources from different positions. Left input channel will be convoluted with IR-channel 2, the result will be added to the right output. Right input channel will be convoluted with IR-channel 3, the result will be added to the left output. Right input channel will be convoluted with IR-channel 4, the result will be added to the right output. True Stereo is only possible with a 4-channel impulse response File. You can generate a 4-channel impulse-response-file by merging two special 2-channel Wav-Files together. Shows a symbolic picture which is attached to the current impulse response. This diagram shows the early reflections of the impulse responses. These are very important for the perception of the character of the room. Every reflection is symbolized as a point, every channel uses a different color. You can change their loudness by dragging and changing the envelope. To remove points from the envelope, use the right mouse click. You can reset the envelope by clicking with the right mouse-click somewhere in the diagram. You can use the draggable handles to select the beginning and the end of the viewable range. You can use various kind of envelopes to modify the impulse in a natural or creative way. Select the envelope you want to modify by clicking on the envelope selector. Add envelope-points with the left mouse button, delete them with the right mouse button. The envelope changes the amplitude over time. A low-pass filter envelope, the edge steepness of the low pass filter is 6dB/octave. A high-pass filter envelope, the edge steepness of the high-pass filter is 6dB/octave. With this control, you can adjust the stereo-signal of the impulse response. From mono (down below) to extra wide (top). This envelope is also very handy when it comes to creating a mono-reverb – just drag the left and the right point to the bottom of the display. Change the panning (stereo-balance) over time. This envelope uses an equal power pan law. You can adjust the point in time where the IR should start by simply dragging the start-locater and where it ends by dragging the end-locater. Only the part between the two locators will be used in the convolution engine. The hashtag library at the top of the preset box helps you quickly find the right preset. The preset-browser recognizes automatically hash-tags in the preset name and displays them as a selectable button. To activate a certain preset, just select it. If you want to delete a certain preset, click on the setting button, right next to the preset-name, and then on "delete". If you want to organize the presets and create/delete folders, click on the "..." button. This will open the location of the presets in the Explorer (Win) or Finder (Mac), and then you can freely manage your presets by just moving the files around as you like. To see the changes, please close and reopen the plugin-GUI. Please note, if you modify files in the factory presets folder, the original state will be recreated, when you reopen the plug-in. By default, when calling a preset, the dry and wet-mix will not change. You can change this behavior by deselecting the "Keep Dry/Wet Settings" check-box. Chooses the right "stereo" or "true stereo" impulse, depending on your current input/output configuration of the plug-in. This folder is where you can place your own impulse responses. SIR3 saves the relative file-path when you choose an impulse from this folder. If you move to another computer, you can simply move the content of this folder to the corresponding folder of the new computer. The location is determined during installation and can only be changed by re-installation. To change the location, de-install SIR3 first, using the setup program, and then reinstall it. At the bottom on the right of the plug-in window, you see the re-sizer edge, which you can use to resize the workspace of the plug-in. The size of the plug-in will be saved with the plug-in instance.